Today is just one of those out of the usual days I come up with an impromptu blog post cause it’s not normal of me to make savory dishes and then post them up online after they turn out this great! But hey there’s always a start. When my mom asks me to cook lunch or dinner, I play safe choosing chicken, not only because it’s a favorite but it’s best for my confidence levels in the kitchen. I can work around a chicken anyway whether grilled, stir fried or curried. Today I chose to soup it out . Ever since my sister got pregnant, we have been trying to scoop up recipes from the past to give her wholesome foods that are made from scratch and almost zero dependent on store bought ready made mixes. But it’s a longer process to be honest but a healthy one atleast. Possibly the only ready made ingredient I used in the soup here is Chinese egg noodles a suggestion I adapted after a bit of recipe browsing online. 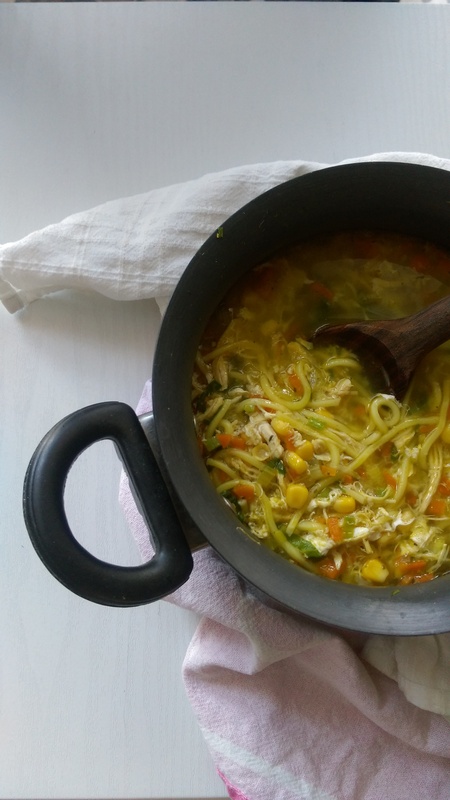 It’s much quicker than macaroni or pasta and adds a tad bit of taste to the broth as well. What lengthens the process is the chicken stock. We did not want any ready made stock for the soup so my mother decided the healthier way to go would be chicken carcass, which we pressure cooked for about 20 minutes. No worries if you don’t have a pressure cooker, simply boil the carcass or chicken whole if required with water and a pinch of salt. Do this a day before you want the soup prepared. Once you have your stock taken out of the bones, cool to room temperature and place stock in the refrigerator overnight. Doing this reduces the fat content of the stock. By next morning you will notice a layer of fat that settles on the top of the stock. Simply scoop it out and keep the stock ready for use. Feeling healthy already? Getting rid of the fat as much as possible and a whole choice of vegetables, makes this perfect for just about anyone. Here’s my tried tested recipe. 1. Begin by heatng olive oil in a non stick deep vessel, and once heated saute garlic finely chopped. Fry until slightly golden brown. Add white onion and the onion portion of the spring onion, finely chopped. Keep the green portion of the spring onion for use later. Saute together until slightly softened and cooked. 2. Add finely chopped carrot, celery and corn . Add a little water, perhaps about 2-3 tablespoons and cook on medium heat until the celery is cooked and softened. 3. Add chicken stock along with the bay leaf and mixed herbs . I used a store bought mixture of herbs that includes dried basil, thyme, oregano and rosemary. Add water about 1 cup to increase the quantity of soup if required. Close the vessel and bring to a boil. 3. Add beaten egg whites using a fork and stir vigorously while doing so. This ensures the egg whites turn into tiny bits in the soup. Add shredded chicken, egg noodles, spinach and greens of spring onion. Add salt as per your taste requirements and bring to boil. 4. Turn off the heat and serve warm. Hope you enjoy this soup as much as my pregnant sister and all of us here at home have. It’s healthy, wholesome and delicious. Do give it a try soon . Until my next post, much love! This looks so wholesome and delicious. Bravo! !